At least 20 people were killed while 111 others sustained injuries after two blasts tore through a Roman Catholic cathedral in the Philippines' isle of Jolo on Sunday. Police confirmed that the bombing claimed the lives of 15 civilians and 5 soldiers, Al Jazeera reported. The Islamic State of Iraq and Levant (ISIL) claimed responsibility for the attacks through its Amaq News Agency, the SITE monitoring group confirmed. 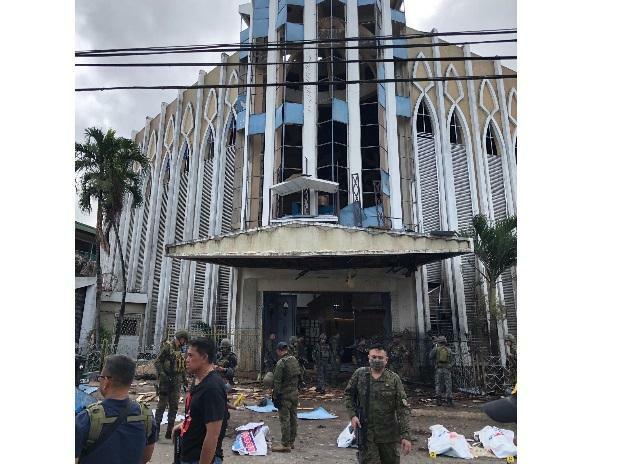 Security officials say that the first bomb was detonated in or near Jolo's Cathedral of Our Lady of Mount Carmel, which was followed by a second explosion outside the compound as government forces responded to the attack. In a statement, the Philippines Army said that the explosions were likely caused by improvised explosive devices (IEDs). The spokesperson for Philippines President Rodrigo Duterte, Salvador Panelo, condemned the "act of terrorism" and pledged that the government will pursue the perpetrators of the attack. "The Armed Forces of the Philippines will rise to the challenge and crush these godless criminals," he said. Pope Francis, the head of the Roman Catholic Church, expressed "the firmest reproach for this episode of violence". "I have directed our troops to heighten their alert level, secure all places of worships and public places at once, and initiate proactive security measures to thwart hostile plans," Defence Secretary Delfin Lorenzana said in a statement. Incidents of violence have long been rampant in Jolo, the capital of the Sulu province, due to the presence of the armed group Abu Sayyaf. Years of bombings, kidnappings and beheadings have caused the group to be blacklisted as a "terrorist organisation" by the Philippines and the US. The bombing incident occurred days after a referendum took place last Monday, which asked the Muslim-majority population if they supported a plan, backed by separatists and the government, to create a new self-administered region, CNN reported. The referendum pertains to the creation of Bangsamoro (meaning Moro nation), the new Muslim autonomous region concentrated in the southern island of Mindanao, that could be the solution for the decades-old conflict between the government and the rebel group the Moro Islamic Liberation Front. The conflict has claimed over 1, 20, 000 lives since the 1970s. While the majority of the 2.8 million participants backed the referendum, particularly the voters in Mindanao, the town of Jolo rejected it.